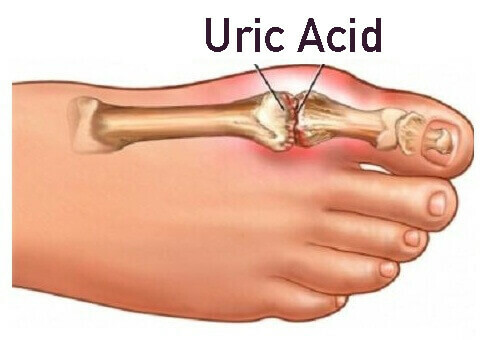 Uric acid is very serious problem. This creates gout, joint pain and arthritis. Daily morning eat 2-3 walnut. This reduces uric acid. The consumption of high fiber food such as oatmeal, beans and brown rice absorbs uric acid and reduces its level. Baking soda is also beneficial to reduce uric acid. Mix one teaspoon baking soda in one glass water. Daily drink 8 glasses of this water. This reduces uric acid level. Baking soda breaks the crystal and dissolves in the blood. But be careful not to take too much baking soda because it can cause you high BP problems. Daily have celery. This also reduces uric acid level in the body. Eat more amount of vitamin C rich food. This removes uric acid through toilet. Daily have one or half lemon in salad. Drink one glass of water squeezing lemon in it. Avoid having outside food and eat fruit, vegetables and fiber rich food. Do not eat things such as rajma, choole, arabi, rice, flour and red meat. Do not take any beverages containing fructose as they increase your uric acid. Daily eat one apple. Apple contains malic acid that neutralizes uric acid. Therefore, uric acid reduces in blood. Avoid fried and lubricated foods to reduce uric acid. Also, avoid having ghee and butter. Avoid having omega 3 fatty acid. Such fishes like tuna and salmon has omega 3 fatty acids. This increases uric acid in the body. If you take 500 mg vitamin C then uric acid reduces in 2 months. Daily drink plenty of water. Drink at least 2-3 liter water. Drinking water avoids uric acid. Daily chew one teaspoon linseed after having meal. This reduces uric acid. 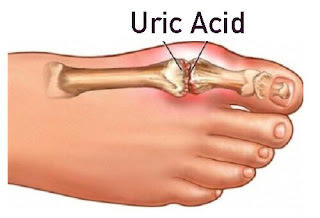 The high amount of uric acid creates gout. Squeeze juice from bathua leaves and daily drink in morning. Do not eat anything till 2 hours.